This was a big week for the 175 graduates of Marquette Law School in Milwaukee, Wisconsin, who were welcomed to their new profession at a swearing-in ceremony with all seven Wisconsin Supreme Court justices this month. At the ceremony, an article for the State Bar of Wisconsin said, Justice Ann Walsh Bradley asked the new lawyers what it really means to uphold the law, a question once answered by the former dean of Marquette Law School Howard Eisenberg. "I think it means when you are putting together a deal for a client and there's a wink or a nod, that you will have the courage to be an aggressive advocate, but you will not shade the truth," she said in her address. "It means that you have the courage to embrace unpopular causes and to stand up for the victims, and the poor, and the powerless in our community." Bradley reminded the new lawyers that there have been many times when those who came before them have lost cases or elections because they did what was right, and she challenged others to do the same. For every part of the legal process, having accurate transcripts is vital to the integrity and outcome of the case. With certified court reporters, those involved can be confident that what is said during a deposition is correctly transcribed, and that no testimonies are misrepresented. 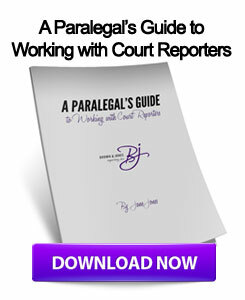 By being able to rely on an accurate transcript from a Milwaukee court reporter, legal professionals can focus on their responsibilities as a lawyer and concentrate on, as Bradley said, upholding the law. This entry was posted on Wednesday, May 29th, 2013 at 10:41 am	and is filed under All Posts, Wisconsin Legal. You can follow any responses to this entry through the RSS 2.0 feed. You can skip to the end and leave a response. Pinging is currently not allowed.